On February 6, 1832, the east pavilion or the Benchers’ Quarters as it is called today, officially opened its doors and the benchers held their first Convocation in the Law Society’s permanent residence. Quickly hailed as an architectural treasure, the building was regularly featured on illustrated maps and postcards of the period. Despite its public popularity, benchers of the Law Society were divided on the necessity and economic sense of its construction. 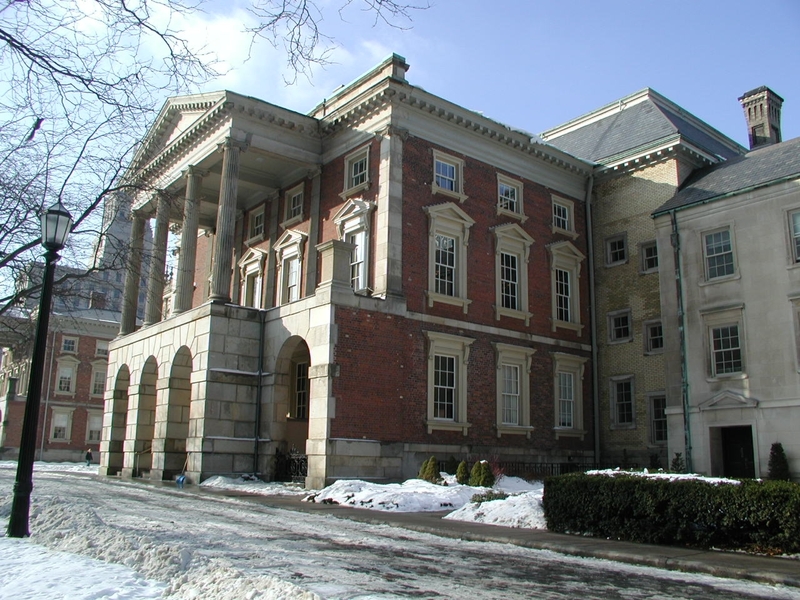 Opponents argued that Osgoode Hall was too extravagant and an unnecessary expenditure for the fledgling Law Society. Others, most notably William Warren Baldwin, the Treasurer of the day, and former Treasurer John Beverley Robinson believed that the Law Society needed to firmly establish its authority in order to protect its right to govern the legal profession. Osgoode Hall symbolized this authority and the Law Society’s burgeoning professionalism. The basement originally contained quarters for the steward and the housekeeper, as well as a pantry, kitchen and students’ dining room. Upon entering the Benchers' Quarters, one is immediately struck by the sweeping staircase, the rich walnut panelling, the stain glass dome and the intricate mosaic floor. In its centre the seal of the Law Society is proudly displayed. Just inside the Benchers' Entrance is the Treasurer's office. Over its fireplace hangs the portrait of a former Treasurer selected by each incoming Treasurer upon taking office. This is just one of the Law Society's many time-honoured traditions. Immediately after the Rebellion of Upper Canada in 1837, the government, fearing another uprising, asked the Law Society to lease Osgoode Hall to it so it could house troops who would protect the city. For the next seven years, the benchers met in the east wing of the old Parliament Buildings at Front Street West between John and Peter Streets. In 1999, during the repair of the floor in the Benchers' Quarters, the fireplace in the Treasurer’s office sunk slightly below floor level. Behind it, a number of what we would today refer to as business cards, were found. They had belonged to officers who had occupied the office during the 1840s. So while the damage was unfortunate, it led to a discovery that was important not only to the history of the Law Society but also to the history of the province. Behind the Treasurer’s office on the north side of the staircase is now the Robing Room for male benchers. Originally, this area housed the Law Society’s library, which was used by the benchers, the Law Society’s members, and students-at-law. The Benchers’ Dining Room is said to be the oldest continuously operating dining room in Canada. When the room was built in 1832, it could have accommodated not only all the benchers but also the entire Bar of the province. The portraits that adorn the walls of the Benchers’ Quarters depict the Law Society's former Treasurers. After the death of William Warren Baldwin, who many refer to as the “father of the Law Society”, a portrait of the former Treasurer was commissioned to hang in Osgoode Hall. Thereafter, it became an accepted tradition that upon the completion of each Treasurer's term a portrait would be commissioned to pay tribute to their contributions to the Law Society. Directly above the Dining Room is Benchers’ Reception, the original Convocation Room in which meetings of the benchers were held. It later became the benchers’ library and locker room and is today used for informal meetings and receptions. There are two portraits of particular legal and political interest in that room. They depict former Treasurer Robert Baldwin (William Warren Baldwin's son) and Louis-Hyppolyte Lafontaine, the fathers of responsible government. On rare occasion, the portraits have been lent to galleries for specific exhibits, evidence of their economical and historical value. Across the hall from Benchers’ Reception is the Convocation Room, where the benchers have met since 1882. The Convocation Room is furnished today with a massive mahogany table dating from 1938. Ten mahogany chairs adorn each side of the table with the finely sculptured Treasurer’s chair positioned at its head. To accommodate the growing size of Convocation, over the years additional chairs have been added around the perimeter of the room. The walls are adorned with the portraits of some of the Law Society's most recent Treasurers, a number of whom attend Convocation regularly. Osgoode Hall is considered a national architectural and historical treasure and is one of Toronto’s oldest and most recognizable buildings. It is the longest continuously used institutional property in the city. A popular stop on Toronto's annual Doors Open tour, it welcomes thousands of visitors over the two-day event. Its beautiful lawns and gardens provide a welcoming oasis for visitors and city dwellers alike. To members of the legal profession, Osgoode Hall has become the symbol of legal tradition in this province. All but the first 35 years of the profession's long, rich history has occurred within its walls. Its construction in the early 19th century provided not only a seat for the Law Society of Upper Canada but lent an air of respectability and professionalism to the fledging institution which was seeking to increase its influence and stature. Honsberger, John, Osgoode Hall: An Illustrated History, (The Osgoode Society for Legal Education, 2004), 55.